My new chicks are due to arrive this coming week. I’ve been trying to figure out how I will house them together with Peepers. He is probably about 4x the size that the new chicks will be, and he’s quickly outgrown the small box I originally had him in. I originally thought about using a giant plastic bin – we have one, but it is somewhere out in the garage I believe, and possibly filled with stuff at the moment. Our garage is kind of a pain to get to in the winter – My dad built it to house his tractor, and didn’t actually put it near the driveway, so we need to trudge through knee deep snow to get to it. I also was thinking that, since it’s only early March now, I will probably need a bit more space because the chickens will be pretty big by the time it’s warm enough to put them outside with the adults. I saw some designs online that people had made for indoor brooders. One person got some large furniture/refrigerator boxes and put them together to make a brooder. I tried asking our local furniture store for some boxes, but they were out of cardboard (someone had taken all their cardboard away the very day I asked). So then I asked at our local grocery store, and they had some boxes. I went and got 8 or 9 large boxes that had been for paper towels and things. 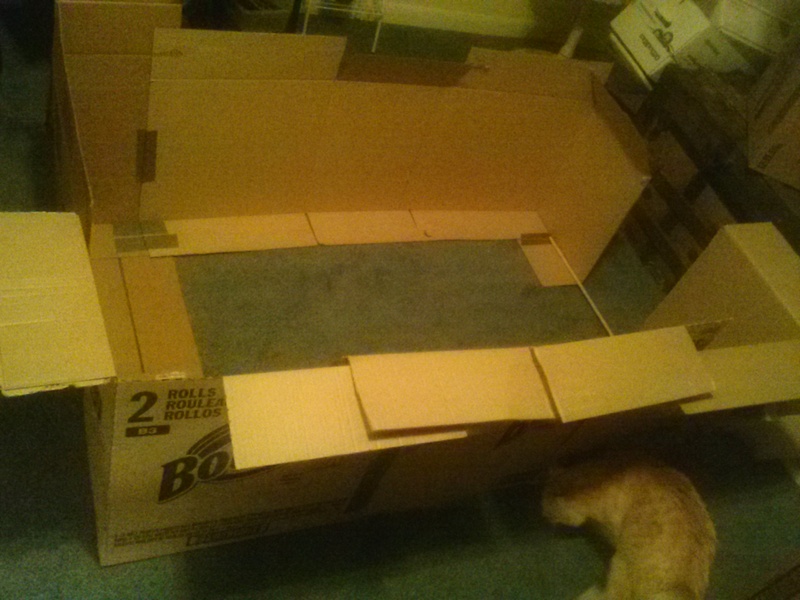 I then reinforced the sides, and added cardboard on the bottom to make the floor. 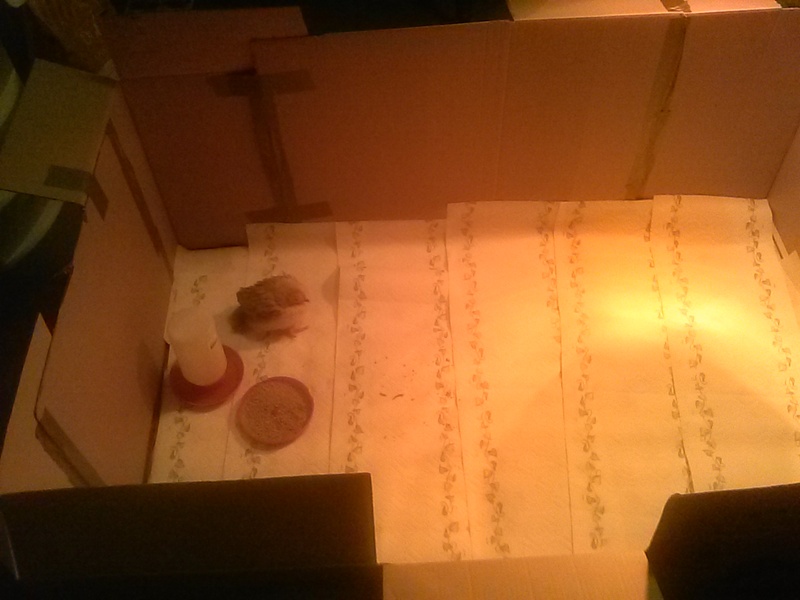 The chick corral / brooder is all put together with duck tape. It comes out to roughly about 4′ x 2.5′ – a decent size, and should keep the chickens happy for awhile as they grow. 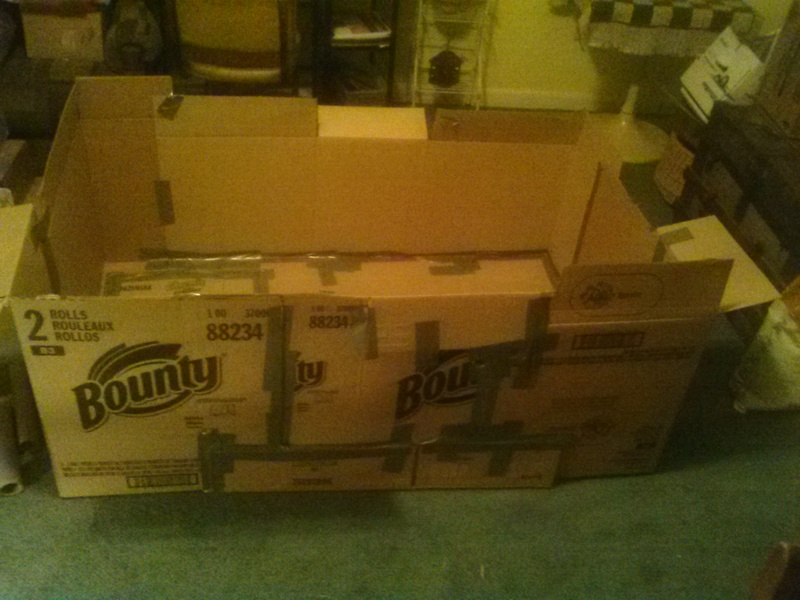 I have extra cardboard to make the sides taller later on as needed. I will probably need this because otherwise I’ll eventually find them perching on the top and hanging out in the room where the brooder is. When I had my last batch of chicks (my current adult population), by about 2-3 months they were already doing that. I was worried about them living outside but soon after they started escaping their brooder I knew it was time for them to go to their coop – plus it was summertime. The brooder is in a carpeted room (my art room which is actually an old bedroom). I had a large thick plastic tarp that I put underneath the whole brooder just to keep the carpet from getting dirty. I had to think for awhile on how to do the flooring/bedding for the chickens. Last time I used newspaper as their bedding with no problem, but I’ve since read that newspaper can get slippery and cause leg problems in developing chicks. I also had to think about Peepers. Peepers has a wonky leg – I think it was caused by the temperature fluctuations from the incubator going bad mid-incubation. That can cause a condition called splay leg in chicks. I didn’t notice his problem right away, because it was just one leg. Over the first couple weeks he started pushing one leg out and now it sometimes is almost behind him when he walks. This can be a fixable condition if caught and fixed within the first few days after hatching, but he was already a few weeks old when I found out what the condition was called and how to fix it. I tried using a bandage method to “train” the leg to do what it’s supposed to, but it just seemed to hurt him and I didn’t want him falling in his water or anything, so I stopped trying to fix it. He gets around ok, but he needs a surface with better grip. 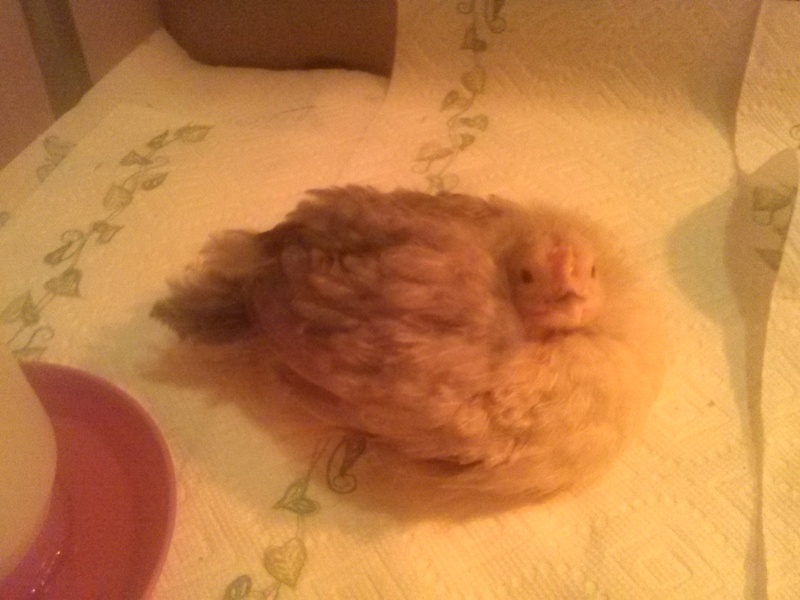 I’ve found that really good quality paper towel seems to be ok for him, so that is what I lined the brooder with. Carpet is actually better – I bring him out on the carpet to hang out sometimes, and he gets around fine on that, but chickens poop wherever, whenever, so for the brooder I need something I can take out and replace frequently. Peepers in the new brooder. I may use some old towels for him if he starts having problems with the paper towels. That way I can take them out and wash and replace them each day. The new chicks should have no problem with the paper towels. I tried some pine shavings with Peepers last week, because I read that those can make a good bedding, but it was very messy and it didn’t seem to give him enough of a grip to get around. I think as he reaches adulthood he should be fine – he will always be crippled so he wouldn’t be able to get away from a predator, but as long as he’s kept safe he’ll be ok. I put him in the brooder and he has a new heat lamp I set up in there, and he started making these little cute noises, almost like song bird noises. I could tell he was very happy in the new box.